Hey Kids! 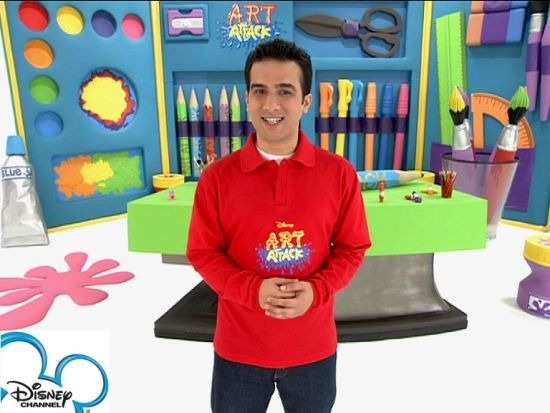 It’s Children’s Day and your favorite host Gaurav from Disney Channels Art Attack is here to teach you how to make cool gifts for yourselves on your special Day. We all love looking at our baby pictures over and over again. So why not make something with them and keep it in front of us always and remember the lovely carefree days once again. Today, I am going to teach you how to make a photo wall hanging. You can use this to decorate your room and make it look nice and bright!! 1. Your old baby pictures. Take as many as you want. Ideally 5 is good. To begin with, take the pictures and with the help of an adult cut the cardboard of the sizes of the pictures. This is so that we can glue individual pictures with the cardboard, to make it firm and thick. Once you have got the cardboard cut, glue the pictures on individual cardboards. Keep it for drying. After the pictures dry up, decorate them in any way you like. You can put sparkles, give borders to the pictures or write something that reminds you of your childhood. With the help of an adult, pierce a hole in the top and the bottom of the images. Now tie one picture with another with the help of a thread. It should look like a chain of pictures, attached with thread. There you are!! Your very own memorabilia.. Now make as many as you want and decorate your room. You can also make a memorabilia for your friends and siblings and give them a children’s day gift. They will love this personalized gift. To catch more such cool arts and crafts tips and tricks watch the latest season of your favorite on-air arts and crafts workshop — Art Attack on Disney Channel every Sunday at 9:30 AM.